Mootthings: This is the end. This lack of time largely results from the fact that for the past couple of weeks I've been doing some extra work in the evenings, with the intention of saving up for a decent digital camera (though as is the way of such things, it rather looks like it might end up being spent on a new clutch). This has been substantially eating into my regular knitting time (except on the train), but in the few minutes between work of one sort or another this week I have managed to make the first learning sock from the New Pathways book. My intention (and the reason that I came away from the yarn-swap with lots of little balls of leftover merino etc.) was to make a pair of each of the little test socks in the book to send to the two-year-old daughter of a friend of mine. 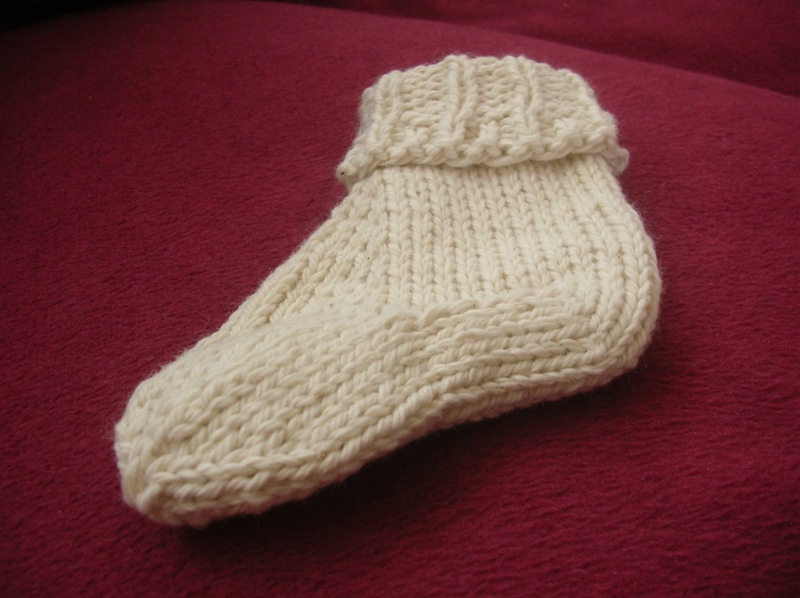 However, though this sock was quite interesting as an exercise in knitting, I can't say I'm all that enamoured of the FO - it seems to have a very flabby gusset and a very pointy toe - so this is it pre-frogging and turning into something else. Having completed both sock projects and hence finally run out of things to knit on the train this week, I briefly returned to my first love - crochet - to make myself a colourful coaster for my desk at work (it's not quite as vivid as it appears in the photo - that's because I had to have the flash on even though it was 10am when I took the picture). The pattern is I think originally from Magknits, though I can't find it now. I made some for my sister a while ago. I don't think they're intended as coasters, but they work. *Fellow Bluestockings who watched me fighting with that recalcitrant skein of Live2Knit Mae Bamboo, which simply wouldn't be wound last Saturday may be relieved to know that C finally beat it into submission with the help of the swift, a chair and about an hour of patiently passing the ball through and over the unwound yarn. Sorry not to have seen you at any Bluestockings events lately. Your 'coaster' is beautiful - and the socks, and the bootee! 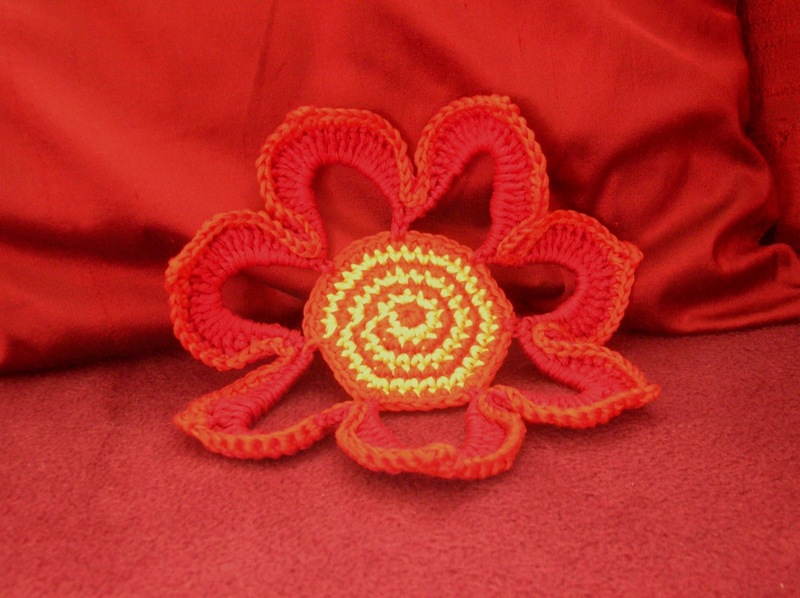 I never realised crochet was your first love! I'm very excited to learn about the maypole stitch, though I imagine this is some kind of euphemism for a circular/weaving motif, with the central stitch being used like 'a maypole' and all the stitches worked into it being a bit like the ribbons winding round, no? How refreshing to find a man who plays with yarn in a helpful/constructive way. R just pulls out huge lengths of it and tangles them whilst I'm trying to knit. On the first "New Pathways" sock I too found the gusset far too long and switched to increasing more frequently (I think e.o. row rather than every 3rd).